When is the last time you cleaned your window coverings? Has it been days? Weeks? Months? Or dare I say even yeeaaarrs? Hmm. Well I’m not surprised. 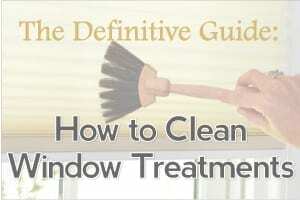 Cleaning your window treatments is not the most exciting thing to do. Oftentimes people don’t know how to do it, or they’re afraid to do it wrong. It can be time-consuming and frustrating… especially with all those slats that collect dust on blinds and shutters. One thing to keep in mind… cleaning your blinds and shutters helps keep them looking fabulous and helps them to last longer too! Because factors like weather, smokers, allergy sufferers, sticky little fingers and pets help to contribute to the challenge of keeping your window treatments clean, ultimately, you and how you live will be the determining factor in how often you need to clean your blinds, shades, shutters or drapes. Let your blinds down as far as they will go, so that as many slats are showing as possible. Turn the slats downward so they are as flat as they will go. Use a feather duster or soft dust cloth and start at the top and work your way across each slat, all the way to the bottom. Turn the slats up and repeat process. Place a sock on your hand, slightly open the slats and run your hand back and forth, over and under each slat. When clean, do another “once over” with a dryer sheet to repel dust. Use specialty tools for cleaning louvers that allow you to swipe several slats clean at the same time, both sides. TIP: Treat the duster with a non-silicone, anti-static spray to attract dust and leave the blind’s surface dust-resistant so it’s easier to clean next time around. 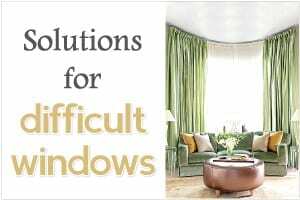 Below I’ve listed specific tips for safely maintaining your window coverings based on the “type” of product. Lay blinds flat in the bathtub. Add just enough water to cover them. Mix in 2 – 3 cups of white vinegar plus a squirt of Dawn dishwashing soap. Let blinds soak for five to ten minutes each side. Wipe both sides of the slats with a soft cloth. Use an old toothbrush or a small paint brush to deep clean in cracks, crevices or hard to reach places. Rinse your blinds with clean water. Hang to dry outside on a warm day, or place on a towel rack or hook to dry. Or you can lay them flat on the floor to dry. Wipe blinds dry with a soft clean cloth (old t-shirt) or chamois. If the weather permits, you can also wash your blinds outside with soapy water, a sponge and a garden hose. Hang blinds on a clothesline or lay flat on the driveway or patio. Then it’s basically the same process as the bathtub—spray with soapy water to dampen, let soak, wipe clean, rinse with garden hose and dry. TIP: If you are uncomfortable submersing your blinds and shutters, you can sponge them down with a mild detergent and warm water solution; blot dry. Occasional light vacuuming with a brush attachment. Spot clean with a soft cloth or sponge. Use a mild detergent and warm water. Vertical blinds may seem daunting when it comes to cleaning, but regular dusting by hand or vacuuming should limit your deep cleaning to only once or twice a year. Starting at the top of each slat, hand dust or vacuum both sides all the way to the bottom. Spot clean soiled areas with warm soapy water or an all-purpose spray cleaner on a clean, soft cloth; rinse well with a clean, moistened cloth. For vinyl or aluminum blinds, place towels or a tarp under the blinds to catch drips. Rinse and wipe dry with clean, dry cloth. Cleaning real wood blinds and shutters require a very specific cleaning routine. Be sure to check if your blinds are real wood or faux wood – as they can be difficult to tell apart these days. First and foremost, regular dusting always helps to keep your all your blinds free of dust and dirt buildup. It also helps your family breathe easier as well, especially if they are sensitive to pollen, dust or allergens. Important: Never get real wood blinds or shutters “wet.” Use furniture polish or lemon oil to protect the wood and restore its beauty. 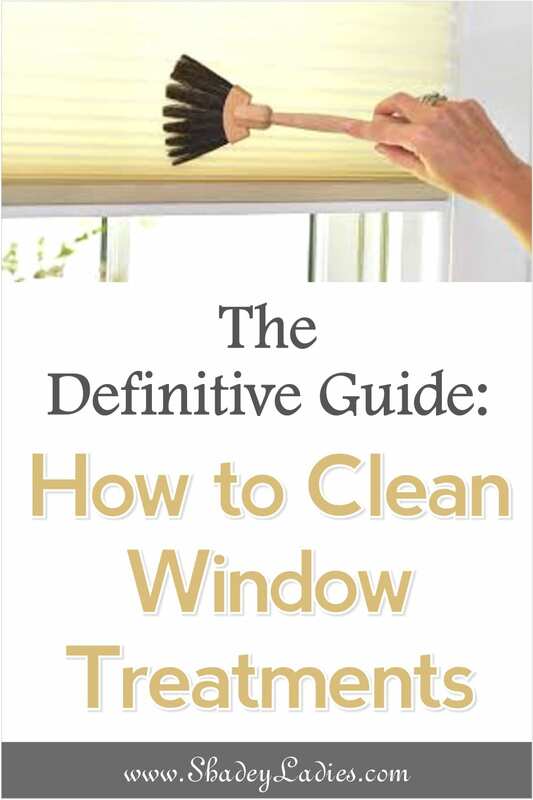 Lightly spray a soft cloth with furniture polish and dust the top, bottom and side of each slat while the blind or shutter is still inside the window. For a badly soiled wood product, use a mild detergent in a small amount of tepid water and a clean cotton cloth. Clean the area and wipe down with clear water; immediately dry with a cotton cloth. TIP: Microfiber seems to be the cloth of choice due to its extreme softness and dust attraction. Swiffer products are also popular for ease-of-use and efficiency. Dust with a feather duster, or lightly vacuum with an upholstery attachment. For dust inside the cells, a blow dryer on the lowest, cool air setting will blow the dust out. Clean with a slightly damp sponge and a mild detergent with warm water. Blot dry. Dry cleaning and ultrasonic cleaning are not recommended. Warning: Extra care should be taken when cleaning opaque / blackout fabrics, as the fabrics may become permanently creased. Gently vacuum first on one side and then the other, side by side, following the pleat. To clean fingerprints or soiled spots, use an aerosol spray foam upholstery or fabric cleaner such as Woolite® or ScotchGard®. Spray the foam cleaner and immediately rub the area with a clean, damp sponge (back and forth gently, parallel to the pleats) until stains are removed. Do not crush, wrinkle or stretch the fabric. Remove excess water by blotting with a dry cloth; rehang the shade when completely dry. Warning: Cleaning too frequently may remove the fullness and body of the pleated fabric. Dust with a feather duster or lightly vacuum fabric with an upholstery attachment. Solar shades are popular for indoor and outdoor use, often on patios or decks to control sun glare. Outdoors shades will tend to get dusty and dirty quicker, requiring regular and consistent cleaning. Lower shade. Lightly vacuum both sides using a brush or upholstery attachment. Softly brush with a mild detergent and warm water solution. Rinse thoroughly and allow shade to dry completely before rolling back up on the roller. Regular maintenance is all it takes to keep these Roman shades dust and dirt free. Roman shades come in a wide range of styles, colors and fabrics, with different fold options from flat to balloon. How you care for your Roman shade is dependent on the fabric, whether it’s washable or not. In either case, frequent dusting or vacuuming will keep your shades looking their best. Dust or vacuum shades to remove loose dirt. Remove all dowels from flat shades; leave strings attached or de-thread and remove them. Wash according to fabric instructions; hang dry to avoid dryer shrinkage. Press or steam out wrinkles; restring and rehang. Dry clean silk, wool, linen or fiberglass-blend roman shades only when they need cleaning. Tell the dry cleaner if you’ve used any chemical spot removers on the shades. Regular dusting is all that’s needed to stay clean. And, as with wood blinds and shutters, never use water or liquid cleaners on woven wood and natural material shades. Lightly dust with a feather duster or lint-free, soft cloth. Draperies will remain beautiful for years to come with proper care. Fabric shades, curtains and draperies can be created from hundreds of different fabrics and in a variety of styles. This is what makes having your own custom window treatments so much fun! Fabrics: Some fabrics require minimal care while others require a bit more consideration and maybe even professional cleaning. For example – silks, embroidered fabrics, linens or those treatments with several layers and linings. Style: Is the treatment complex? Does it have multiple layers? Does the treatment have a lot of construction to it – ie swags, cascades, balloon shades, etc? 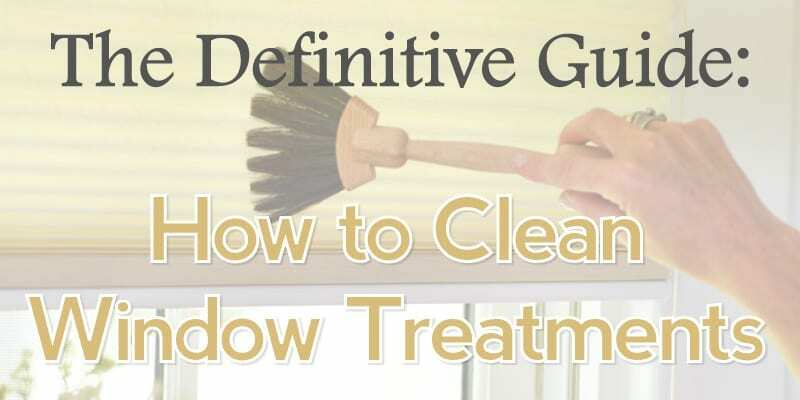 This must be taken into account when it comes to how you’ll clean your window treatments. Less construction = easier cleaning. More construction = more complicated cleaning. When it comes to keeping your window treatments looking vibrant, fresh and fabulous, there really is only one thing you need to do… consistent upkeep. When you are consistent in your upkeep, you make sure that dust and grime never get the upper hand. This in turn keeps your fabric shades, curtains and drapes looking good as new and lasting longer. Dust or vacuum the front AND back of the shade or drape. Pay close attention to the top. Creases and pleats collect more dust; this includes drapes, shades, valances, cornices, swags, cascades, etc. Check for any damage. Repair any loose or broken strings, loops, torn stitching or drooping hems. 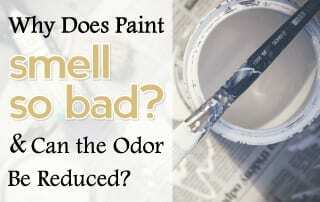 Immediately spot clean any soiled areas on shades and drapes. Do not use strong detergents or spot removers as they can fade the color and weaken fibers. Experts agree to disagree on how to best maintain draperies. Some recommend dry cleaning; others, like us do not. The exotic and luscious fabrics that make up many of our custom drapery treatments can shrink when dry cleaned. Regular and careful vacuuming is typically sufficient to keep draperies in beautiful condition. Pay close attention to the top of the drapery, front and back, since dust and dirt tend to settle in the pleats and gathers. If curtain fabric is washable, follow manufacturer’s care instructions or use cool water, gentle cycle with Woolite and hang to dry; iron while still damp. NOTE: If drapery is lined, be sure both the face fabric and the lining are washable. If the curtains aren’t difficult to detach, you can take them outside and shake them for a good dusting. When dusting and spot cleaning aren’t enough and deeper cleaning is desired, ultrasonic or injection/extraction cleaning with a reputable, professional blind and drapery cleaner is an option. Professional cleaners use a variety of methods to clean window coverings and can vary in their capabilities. 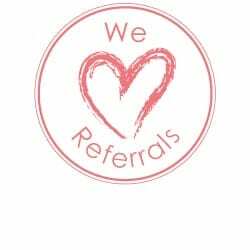 (Recommendations from friends is a good place to start, as well as online reviews.) Before you trust your window coverings to any cleaner, know the fabric content you’re dealing with and how it will react to cleaning. If you’re in the market for new window treatments, you’ll want to be clear about the care and cleaning of your final products, especially if you have children and pets, or allergy sufferers who require a dust-free environment. We can help you select fabrics and styles that will completely satisfy everyone’s needs while providing beautiful and easy-care designs. Give us a call and we’ll bring samples and design ideas right into your home so you can shop where your windows are. Call 949-494-3345 today to schedule a custom, in-home consultation. 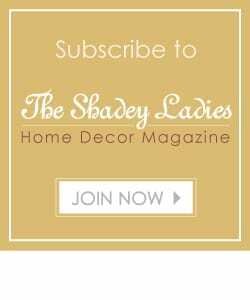 Or go to http://www.shadeyladies.com/gallery for inspiring ideas for window treatments in your home.